Has anyone made Wheel-Engaging Adaptors for Car Lift? Or know how to make them? If I understand correctly you wish to lift a vehicle by it's hub assemblies? Not quite. It's lifting from the tires, like the 4-point runway lifts. It's recently become more popular in service on modern unibodies, and especially hybrids and electrics, because lifting points have become more specialized and harder to access. The design would depend on the type of hoist. 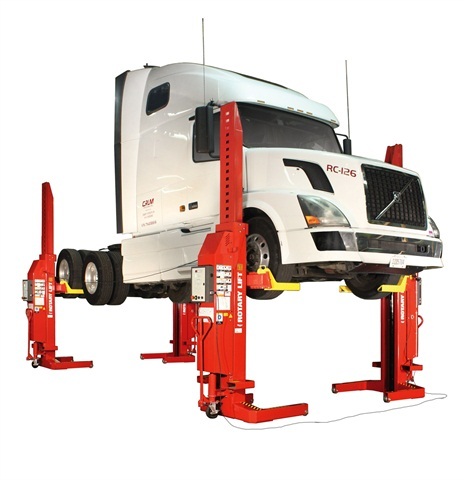 I have a four post mobile unit like that for trucks but it's called a wheel end lift. It's not installed yet and purchased used as they are expensive. Many new cars w/plastic lowers are getting increasingly difficult to lift with my surface mount units which are Rotary brand so I've considered replacing one of mine with something like this for cars also. I'd never heard of them referred to as "wheel engaging" however. Please check out photo it was made from billet and is not on the market for sale. Yes, that is very similar in design, (albiet lighter) than mine designed to lift from the tires. I took your original question as actually "engaging" the wheels, or lug studs. Mine is four separate posts which are rolled into position on semi tractors or busses at the axles, then all four posts are elevated via a single station pendant control. I plan to purchase the radio remote control but haven't yet. I need to find or build two more posts to elevate a tandem axle setup and it all comes together in time. Did you design and make your own adapters or did you purchase from a vender? No, this is a manufactured set I purchased from a truck shop going out of business. They are "Mohawk" brand if I remember correctly. The are adjustable in the lifting saddles for small to large tires in both width, and depth. All four columns are on collapsable mount casters so when no weight applied, they can be rolled to a sidewall and stored out of the way. I'll probably replicate the assemblies for the balance I'm needing. These are not as low profile as your photo shows as my setup is not designed for automotive, (cars) use, and the system is rated at 40K lift to 78" from floor height. In this pic they are only lifting by the rear axle, so maybe it isn't really necessary to lift both drive axles? I'm sure it's probably as safe as lifting a car on a lift bolted to the floor, but at a glance, having 40k over my head "balanced" on these columns seems scary! Yes, same pricipal. You can lift by a single rear axle but it limits what you can do at times. If you lift by all axles you don't let a lot of dead weight rest upon the jounce bumpers, or air back travel limits which can hurt parts. They are actually very stable with weight upon them as the bases are quite wide but require a good floor to bear upon. Designed & welded correctly.... how handy ! or even Yankee-hacked... I pitty the poor soul who can't tell the diff! I can see where those portable deals would be handy even for car-use. Probably way more expensive than a traditional 2 or 4 post lift, though.